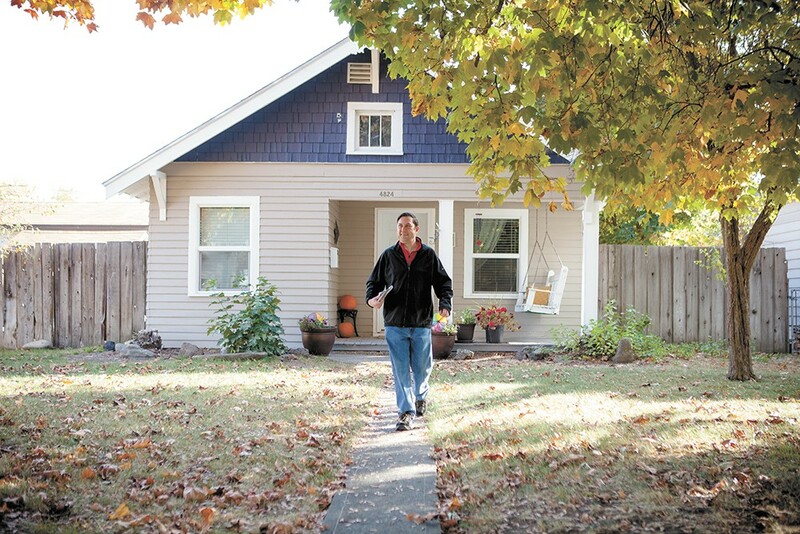 Despite having more endorsements and campaign money than his opponent, Council President Ben Stuckart isn't taking his re-election for granted and spends his Saturdays knocking on doors. Ben Stuckart's first foray into electoral politics ended with "a punch in the gut" from Spokane voters on a November night five years ago. At the time, Stuckart was executive director of Communities in Schools of Spokane County, a nonprofit focused on reducing dropout rates. He was also campaign spokesman for a ballot initiative for a tax levy that would've created the Children's Investment Fund. The fund would have been used to prop up youth-oriented programs, and education advocates argued that it would cut the city's dropout rate while producing graduates less likely to end up in jail or on public assistance. On election night, supporters crowded into a downtown bar. Excitement bubbled up when a reporter erroneously said the initiative had passed. But the hope in the room soured to disappointment when a closer reading of the results revealed an electorate, recovering from the recession, refusing new taxes. Until that night, Stuckart had succeeded at nearly everything he'd taken on. He earned accolades on the debate team at Gonzaga and had a successful career selling tickets before helping build a Spokane County affiliate of Communities in Schools. "I thought I could win because I work hard," says Stuckart. "If I put my mind to things, I can win." Just a year after that defeat, Stuckart would re-enter electoral politics, beating two established politicians and being elected city council president. During his time on the council, he has applied lessons learned from that defeat to promote his vision of Spokane as a place that people opt to stay in, rather than leave. That vision, steeped in social-justice Catholicism, includes protections for workers and the poor. In pursuit of that vision, Stuckart has won over would-be opponents and passed ordinances over the objections of a more conservative mayor. "He's changed the focus of the city council president position and the city council," says Kerry Lynch, the president of public relations firm Alliance Pacific, who's become a regular adviser to Stuckart. His detractors say that change is for the worse, scaring away businesses and stretching the scope of municipal government. Mike Fagan, his biggest critic on city council, says that with Stuckart and his allies on the ballot, this election is a crossroads for Spokane. "His vision, the way I look at... is he wants to make Spokane another Seattle," says John Ahern, a former Republican state representative who's running to replace Stuckart. "We are more conservative over here, so that's why Stuckart needs to retire." It's mid-morning on a Saturday, and Stuckart, who has ditched his suit and tie for a long-sleeve Gonzaga T-shirt, is beaming that 22 people have shown up at an Albertsons parking lot on the South Hill to doorbell for him and fellow city council candidate Lori Kinnear. "Does everyone have literature and addresses?" shouts a volunteer. In the background, Stuckart's mother, Mary Anne, jokes that she could tell stories from high school about why not to vote for him. Someone asks: "What if they say, 'Ben is going to win anyways?'" "Just tell them that it's very important," Stuckart replies. "If only I win, and the people down-ticket don't, we are going to be in a world of hurt." Volunteers disperse and Stuckart steps into his 2001 Toyota Corolla. There's an Obama '08 sticker on the bumper. On the floor are maps, empty Gatorade bottles and old newspapers. In the backseat is a cooler full of booze, left over from a campaign fundraiser hosted by local artists at the art gallery recently opened by Terrain, an arts nonprofit on whose board he serves. Stuckart only has 15 minutes to doorbell before he's supposed to speak at the quarterly county Democratic Party meeting. After parking in a nearby neighborhood, he walks briskly, explaining that he's been the primary sponsor of more than 70 ordinances or resolutions, making him more productive than any of his predecessors. City government, says Stuckart, is about roads, garbage pickup, 911 and utilities. After that, he says, "it becomes how do we create a tax base — and that goes to things like planning — and how to attract business. "You don't just say we are going to cut taxes and deregulate, and the companies will come," says Stuckart. Stuckart left Spokane for the Bay Area the day after Gonzaga's graduation ceremony in 1995. Spokane, he says, needs to become a place where young, educated people will want to live. This demographic, he says, will attract businesses or start their own. Under Stuckart, the council has implemented a strategy of "targeted and concentrated investments," pouring city funds into housing, streets, utility infrastructure and public safety in neglected parts of town, like East Sprague, in hopes of making them attractive to private investment. He's also supported an ordinance removing parking requirements for businesses to make neighborhoods more walkable, and has pushed for a pedestrian bridge connecting the University District to East Sprague. The investment strategy won him an endorsement from the Spokane Association of Realtors for its potential to increase property values. "We are joining the rest of Washington state," says Councilman Jon Snyder of Stuckart's leadership, specifically his support for investments in transit and labor protections. "We are not just isolated out here on our own." In between doors, Stuckart explains that he's had a few negative interactions while campaigning. One volunteer told Stuckart that a voter shouted: "That socialist! That communist! I'm not voting for him!" "I think people call names when they don't understand a policy," says Stuckart. "What have I done that's so horrible?" Plenty, says Ahern, the five-term Republican state representative who is challenging Stuckart. Although Stuckart has publicly denied it, Ahern insists that Stuckart will pursue a $15-an-hour minimum wage, like Seattle, if re-elected. Ahern highlights his state legislative work getting funding for an Eastern Washington veterans' home and a bill allowing felony charges for chronic drunk drivers. He says he'd improve the city's business climate by removing regulations on business, though he's not sure which ones. "I haven't examined all the different types of regulations," he says. "I'd have to check with the business community to find out what regulations they want to get rid of." An energetic and cheery 80-year-old, Ahern says he's not worried that Stuckart has a longer list of endorsements and, according to the most recent campaign finance filings, nearly a $100,000 war chest compared to his $7,600. He's adamant that he will win by knocking on more doors. Stuckart says he learned, from his failed Children's Investment Fund campaign, the political importance of having buy-in from other elected officials and the business community. Calling the $15 minimum wage proposal a "made-up issue," Stuckart highlights endorsements from Avista, Gallatin Public Affairs and the Spokane Home Builders Association that he says prove he's pro-business. Ahern — routed by a nearly 2-to-1 margin in a bid for Snyder's seat two years ago — has the endorsement of Spokane County Prosecutor Larry Haskell and County Treasurer Rob Chase, who describes Ahern as a "gentleman" who would bring experience and political balance to a council that leans to the left. The entire council endorsed Stuckart, with the exception of Fagan. "As much as I hate to say it, no disrespect to John Ahern, I think a lot of people would rather see John Ahern on the sidelines mentoring young people rather than running," says Fagan. Stuckart was born in Spokane in 1971. His father, Larry Stuckart, was an advocate for the city's poor who led the nonprofit social services organization SNAP. His mother, Mary Anne, was an educator and one-time chair of the Spokane County Democratic Party. He became politically aware at a young age attending St. Ann's Catholic Church. The church was providing sanctuary to a Salvadoran family, fleeing death squads in their homeland, and Stuckart remembers hearing homilies about what to do if federal agents were to ever conduct a raid. "They gave homilies about why nuclear weapons are wrong, and then people from our church would get arrested at Fairchild Air Force Base [where nuclear weapons were stored] and we would pray for them next week," he says. Stuckart spent one year at George Washington University, where he joined a frat and was more focused on drinking than studying, before transferring to Gonzaga. He remembers once coming home to visit and seeing his father deeply distraught over SNAP losing half of its federal funding. "It was the second time I'd ever seen him having a drink [of liquor], and he was so upset that he was crying," recalls Stuckart. His father passed away last year, but one guiding principle has remained with Stuckart. "Capitalism has a certain percentage of people who are unemployed," he says. "And if we ever went to zero percent unemployment, the way the labor market works, capitalism would collapse. So it's necessary to have a certain number of people at the bottom of this system." Stuckart says he has an upper-middle-class life because of capitalism: "And if I'm living in a system that requires there to be some people at the bottom, then it's our moral responsibility as people who live in that system to take care of those at the bottom." Under Stuckart, the city council has passed ordinances directed at those at the bottom. It has passed ordinances targeting wage theft, requiring contractors working on public works projects to include apprentice labor, and codifying a police policy that limits when city employees can ask about people's immigration status. Stuckart also has proposed an ordinance mandating that some employers give workers paid days off to deal with illness or domestic violence, which has been shelved. The Spokane Home Builders Association has opposed some of these measures, as well as others. But Michael Cathcart, the association's lobbyist, says Stuckart has listened and tried to find common ground, which is why they endorsed him. Others take greater issue with Stuckart's goals and approach. "I've been very fervent on focusing on city and not national issues, unless there was an absolute, direct impact," says Mayor David Condon of his central difference with Stuckart. For instance, Condon opposed the apprenticeship ordinance. After it was passed over his objection, Condon said it required substantial revision. Ahern has made the immigration status ordinance a key issue in his campaign, saying it makes Spokane a "sanctuary city" and invites criminals and terrorists. "I think [Stuckart] has a socialistic agenda," says former Councilwoman Nancy McLaughlin. Both McLaughlin and Fagan say that the current council has taken on too many misguided social initiatives that detract from the city's core mission. Karen Stratton's appointment to the council last year, which created a 5-2 liberal majority that could overcome mayoral vetoes, has also raised concerns that Stuckart is getting his way too often. Tom Keefe, former chair of the Spokane County Democrats who supports both Condon and Stuckart, suspects that Stuckart eventually will run for mayor. In the meantime, having such a strong majority on the council, says Keefe, has given Stuckart quasi-executive powers. Keefe points to how Stuckart passed an emergency ordinance this past summer, over Condon's objections, that required two firefighters to be on emergency calls. That situation, says Keefe, was a "misuse of the legislative branch." As his term has gone on, Stuckart has been criticized for being increasingly prickly, and Keefe says that Stuckart is becoming more like his predecessor, the infamously brash Joe Shogan. "I think Ben has developed some of that imperial impatience," says Keefe. "And maybe that's an occupational hazard of the job." During a hearing this past winter on a ballot initiative seeking to undo the immigration-status ordinance, supporters and opponents packed the council chambers, cheering and clapping in violation of council rules. While Ahern was speaking, Stuckart decided he'd had enough and angrily slammed down the gavel, ending the meeting. Ahern says he'll be more patient during public comment period. "I would start the meeting with a prayer," he says. After doorbelling, Stuckart takes a few drags off a Camel cigarette before heading to the Bethany Presbyterian Church for the county Democratic Party meeting. He chats with state Rep. Marcus Riccelli and thumbs through Facebook on his iPhone until it's his turn to speak. During the campaign for the Children's Investment Fund, Stuckart says there was a quiet effort to link it with Envision Spokane, a group that has perennially qualified progressive ballot measures. This year, Envision's Worker Bill of Rights is on the ballot; Stuckart makes it clear that he thinks it will be a disaster if passed. "It's not being run for worker rights," he tells the 30 people in attendance. "I want to get everyone to a $25-an-hour wage, but there are right ways and wrong ways." Lynch, who worked on the Children's Investment Fund campaign, says she's seen Stuckart grow into the position of council president — a relatively new position, first elected in 2000 — that she says is also growing. Since the Children's Investment Fund was voted down, she says that Stuckart has seen the potential for city government to address issues seemingly outside of its scope. Stuckart says he's learned many lessons from that campaign. Now, five years later, his belief in the potential for municipal government has remained steady. This article has been updated to clarify that Stuckart held a fundraiser at the physical space owned by the arts nonprofit Terrain, but was not hosted by the organization.